She was visiting the seaside city with her husband in August, and they thought it would be fun to rent two of Lime's electric scooters. A San Francisco Bay Area local and an avid cyclist and skier, Brogan liked the idea of zipping around town without using a car. After cruising along for about a mile, the couple started to descend a steep hill. Brogan, 63, eased on the brakes as her scooter gained speed — only to discover they didn't work. Silicon Valley is known for "disruption" — the idea of changing a service or product with technology to make it better. But, over the past few years, many of these innovations have produced unintended consequences. Facebook, originally conceived to "connect" people, is being blamed for undermining political elections around the world. Uber, devised to provide rides at the "touch of a button," is said to exacerbate traffic problems and clog city streets. 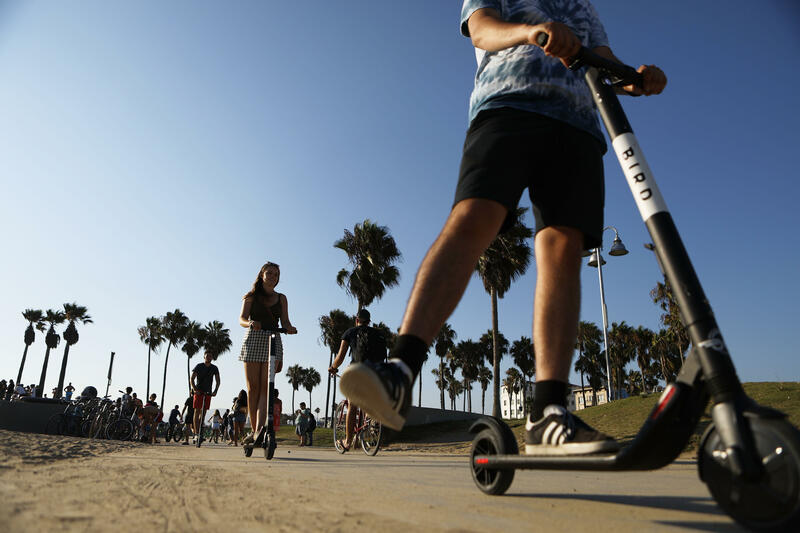 Now electric scooters — first seen as a fun way to solve the last-mile puzzle — are leading to deadly situations. Scooter accidents happen for a lot of reasons. Sometimes the rider doesn't have control and runs into a curb or wall. Sometimes a car crashes into the rider. And sometimes, the scooter is the problem. Doctors and lawyers report instances when riders say a scooter's throttle got stuck or the brakes failed — like what happened to Brogan. A quick sweep of local news stories brought up at least 50 incidents in the last six months. The tales are often gruesome. Like in San Antonio when a tourist accidentally turned into oncoming traffic and was hit head-on by a pickup truck. Or when an Oklahoma City man, traveling at full speed, clipped a metal drainpipe and was thrown over the handlebars — breaking both arms. Or when a rider in Cincinnati ran a red light and crashed into two pedestrians, sending them both to urgent care. Doctors say the fact that very few people wear helmets is also contributing to the rise in serious injuries. Bird and Lime do have small stickers affixed to their scooters telling people to wear helmets, but the vehicles don't actually come with helmets. Colwell said only about 30 percent of scooter riders wear helmets, while around 72 percent of cyclists wear them. "Over and over, it's the same malfunctions that I'm hearing — the brakes failing, the throttle sticks and the scooter dies midride," Lerer said. "Something is not right." Now, three months later, the pins are out of her knuckles and her bruises have faded. She's still going through therapy to get movement and grip back in both of her hands. Even after everything, Brogan still appreciates the idea of electric scooters — with some reservations. "It's a great concept," she said. "But it's not ready for prime time." This article originally appeared on CNET, titled "Electric scooters are now disrupting wrists, elbows and heads"